Considering it was just Jimmy Page's birthday, yesterday, it's the perfect time to let you in on the fun shows going down this weekend at House of Blues. We shot these guys at Do Division back in the summer and didn't even realize who was Mr. Robert Plant, incognito! Any guesses? These talented and prolific musicians, in their own right, not only dress the part for Zeppelin 2, but take on the mannerisms and persona of the band as well. This lethal combo of sincere tribute, excellent musicianship and campy parody, makes for a killer show. Zep 2 is serious musicians, playing seriously legendary tunes, who don't take themselves too seriously. Come down and check 'em out. JAN 13, 2012 House of Blues "1971 Set"
JAN 14, 2012 House of Blues "1975 Set"
We plan to shoot their show Sat. and should have more, fun, live show shots shortly on ChiIL Live Shows and ChiILMama.com. LED ZEPPELIN 2 ... THE LIVE EXPERIENCE brings you the excitement of Led Zeppelin "In Concert" by re-enacting the live improvisation & onstage interaction that earned Led Zeppelin their legendary status for performing. 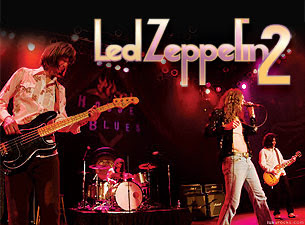 LZ2 has played major venues across the US in 2010 and 2011 and drawn rave reviews for a "spot-on" Zeppelin show, playing deep cuts and classic tracks from the entire catalog, and occasionally entire Zeppelin shows from specific dates. Canadian-born Drummer Ian Lee's dad was a well-known folk musician (the satirical and occasionally controversial Brothers-In-Law) Starting drums at age 8, Ian moved to US to join Bad Oskar, opening for Ted Nugent and national acts. In Chicago, Ian drummed for Woolworthy, Not Rebecca, and with members of Cheap Trick, Veruca Salt, Ministry, and Urge Overkill. Currently from Arizona, Lee runs the www.thebestdrummerintheworld.com website, and was recently featured in Asylum magazine "How to Be John Bonham -- A Drummer's Guide". After winning Downbeat awards on jazz trumpet in high school, Matthew picked up bass. In 2001 Matthew joined Chicago-based Ghettobillies, playing upwards of 200 gigs a year, including shows with Alice Cooper and The Allman Brothers, and numerous European tours. Matthew was voted best un-signed bassist in America at the 2004 National Emergenza battle of the bands. and has played with Pete Special (The Band), Umphree’s McGee, Nyco (Ted Atkatz of CSO), Underwater People, Matt Walker (Smashing Pumpkins, Garbage, Morrisey). Matthew handles bass, keys, and mandolin in Led Zep 2. By age 12 Paul was playing lead guitar in bands on Chicago's southwest side. Kamp is recognized for his work with Busker Soundcheck, a Chicago trio known for inventive, interactive rock songs, including bowed-guitar and a range of electric and acoustic styles, a staple of the 1990's Chicago music scene. Busker Soundcheck was a touring machine, with studio recordings hailed on several prominent critics' "Best Of" lists. Greg Kot, Chicago Tribune, called Kamp "one of the most accomplished guitar players in the Midwest" and he earned a nomination as "best guitarist" in the Illinois Entertainer magazine. For more info, check out the band's main site right here.